Rapunzel in Pink and Purple dress. Barbie Rapunzel dress up like Disney Rapunzel ;). Wallpaper and background images in the Barbie Movies club tagged: barbie rapunzel pink purple dress. This Barbie Movies fan art might contain gown, polonaise, dinner dress, dinner gown, formal, and evening gown. LOL! 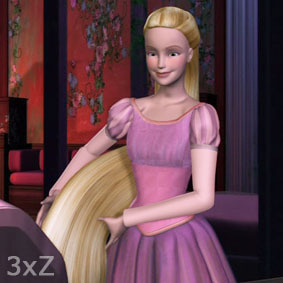 Rapunzel dressed like Punzie. Good idea!